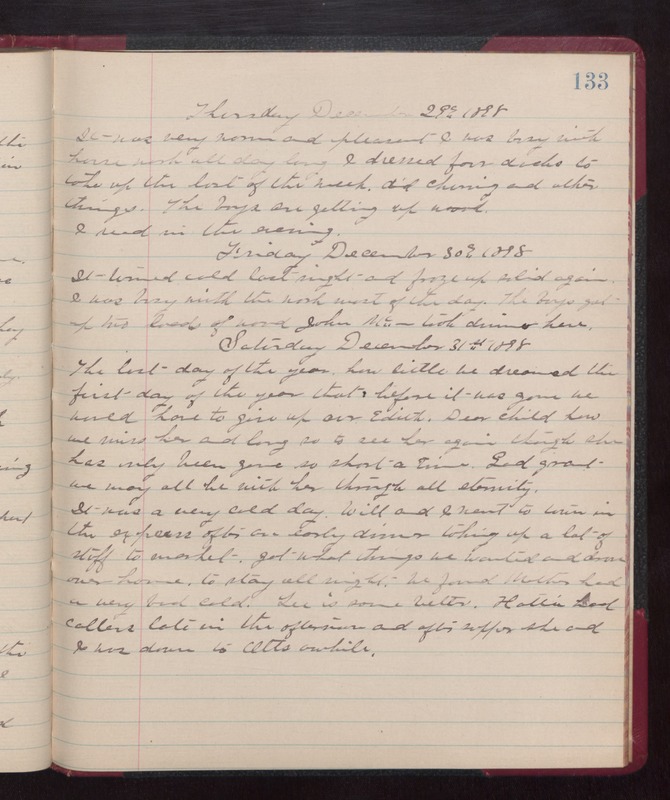 Thursday December 29th 1898 It was very warm and Pleasant. I was busy with house work all day long. I dressed four ducks to take up the last of the week. Did churning and other things. The boys are getting up work. Friday December 30th 1898 It turned cold last night and froze up solid again. I was busy with the work most of the day. The boys got up two loads of wood. John Mc-- took dinner here. Saturday December 31st 1898 The last day of the year. How little we dreamed the first day of the year that before it was gone we would have to give up our Edith. Dear child how we miss her and long so to see her again though she has only been gone so short a time. God grant we may all be with her through all eternity. It was a very cold day. Will and I went to town in the express after an early dinner taking up a lot of stuff to market. Got what things we wanted and drove over home to stay all night. We found Mother had a very bad cold. Lee is some better. Hattie had callers late in the afternoon and after supper she and I was down to Otts awhile.